Three final-year Monash Bachelor of Science Advanced – Global Challenges (Honours) students researching the impact of young people in residential aged care (RAC) facilities have made a formal submission to the Joint Standing Committee on the National Disability Insurance Scheme (NDIS). The research comes ahead of the Federal Government’s announcement this week of the Royal Commission into Australia’s aged care sector. Currently, about 6,200 disabled Australians under the age of 65 are living in Residential Aged Care (RAC) facilities. The vast majority have a moderate to severe level of disability from conditions such as Acquired Brain Injury, Multiple Sclerosis, to Motor Neurone Disease or intellectual impairment. They do not receive the same clinical care as their able-bodied peers. Young disabled Australians in RACs (YPiRAC), their carers, and advocacy groups have widely acknowledged that such facilities are not designed or equipped to support this group of highly vulnerable people and that there is an urgent need to develop alternative care models. An estimated 2,000 people under the age of 65 years continue to be admitted to RACs every year. 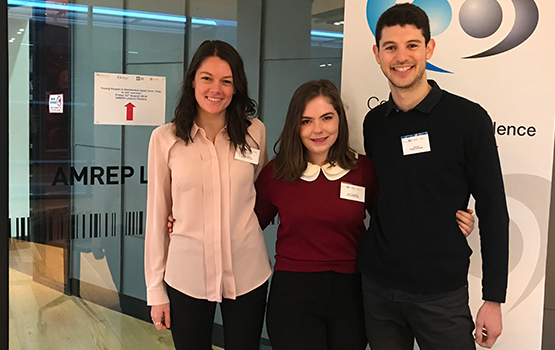 As part of their Honours year, Josh Zail, Alex Hopkins and Anna Cartwright completed three inter-related research projects on YPiRAC. Working with data supplied by the Victorian Institute of Forensic Medicine, the students conducted a geospatial analysis of the population distribution of young people in RACs, an epidemiological analysis of the causes of deaths in these facilities, and consulted with an expert panel to identify injury prevention recommendations. “The aim of this research is to contribute to the knowledge, policy and practice base for improving the quality of care for young people in RACs,” said Professor Andrea Robinson, the coordinator of the Honours program of the Bachelor of Science Advanced- Global Challenges (Honours) degree. Through the advocacy group Summer Foundation, the students met with the Senator for Western Australia, Jordon Steele-John, who this week pleaded for an inquiry into disability care. The students have also met with Shadow Minister for Disability and Carers, Carol Brown, and the Aged Care Advisor of Minister for Senior Australians and Aged Care, Ken Wyatt and Kaye Ervin, to discuss their research. In addition to preparing a formal submission to the Joint Standing Committee, they have also been speaking at clinical forums at the Alfred Hospital and Australian Institute of Health and Welfare (AIHW). “Little is known about the geographical distribution of the YPiRAC population,” said student Josh Zail. “My data mapping showed that regional areas, particularly in Victoria, are over-represented in terms of young people in RACs,” he said. “The demographic maps also show high proportions of such populations in outback areas in Australia’s north and west and reveal that YPiRAC gender proportions vary significantly between areas. The students have been analysing the reasons for entry into RAC facilities, the causes of deaths, and whether the deaths could have been prevented. “By examining the coronial data of 119 Australians provided through the National Coronial Information System I found that the majority of young RAC residents die from causes directly related to their clinical reason for entry,” said student Alex Hopkins. “Interestingly, exactly half of those who entered RACs for a naturally occurring condition (e.g. Multiple Sclerosis) also died of what was classified as natural causes. “Moreover, over half of the causes of death were deemed to have a less than 50% chance of being prevented. Focusing on injury prevention, Anna Cartwright worked with two expert/stakeholder panels with participants representing government, advocacy, health care and research, to develop recommendations for injury prevention for young people in RACs. “Ten recommendations were developed encompassing the themes of improving quality of care, developing collaborative approaches, increasing choices, and reviewing and reporting,” Anna said. “Many of the recommendations focused on system-level reforms which may have stemmed from the participants’ sense of urgency around the issue of young people in RACs,” she said. The students hope that their formal submission to the Joint Standing Committee on the NDIS will help contribute to the discussion on the Scheme’s implementation and performance and offer recommendations on improving the quality of care and life for YPiRAC. “In our research, we found that for some young people with a disability, RAC facilities may be the best option,” said Anna.